After setting up your Raspberry Pi you probably don’t want to use your keyboard and mouse. That’s where a remote connection helps: You can have remote access to your Raspberry Pi through SSH from every other computer which is in the same network as your Pi. In this Tutorial you will learn how to use SSH for connecting to you Raspberry Pi. Hint: If you want to have access with a GUI (like TeamViewer or VNC), you can establish a remote desktop connection. With this default configuration of Putty you are not able to see all programs, especially not GUI programs. However if you want to start those kind of tools (like the GUI editor gedit), you need to install a X Windows System like XMing. After the installation you have to start it. It has no graphical user interface and will just run in background. Now go back to Putty and select Connection > SSH > X11 and check “Enable X11 forwarding”. That’s all! Optimally you save the settings. If you now login (first category: Session) X11 is enabled and you can open GUI programs, too. After establishing the connection by clicking “Open” a new window appears. Here you should insert your username and password. 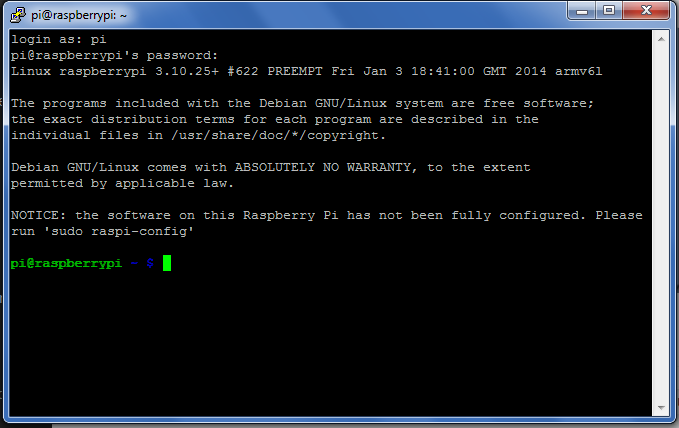 The Raspbian Wheezy/Jessie default login is user “pi” with password “raspberry“. If you have not already changed your password, you should do this now because not only you but also everybody else in your network could have remote access to your Raspberry Pi (if the default password is known). After you confirmed your new password you have obviously to use it on your next login. In addition to Raspberry pi, you can use tools like on premise R-HUB remote support servers for remotely accessing computers. It works on Windows, MAC, Android, iOS, Unix (Browser based), Linux (Browser based) etc.